You Don’t Need to be James Bond to Keep Track of Your Tools. If there’s anyone in the construction industry who does more extensive detective work, or secret spying missions than the warehouse manager, I’d be surprised. With tools coming and going, not being returned at the end of the day, or assets simply “vanishing” into thin air, warehouse managers must tap into their inner-agent 007 to find out what’s happening out there! It is tempting to think that in today’s electronic world a tool manager should be able to spy on the location and movements of every tool. However, despite promising technology methods for keeping track of the hundreds (or thousands) of tools that move around throughout the day, the reality of tool tracking is very different from the spy tactics in a classic James Bond movie. Sure, while the gadgets you’re hearing about in the industry might seem like something Bond would have in the trunk of his Aston Martin, the truth is, used alone, they’re probably more frustrating than helpful. Let’s take a look at one of the more popular new technologies and see if it’s really going to help your missing tool detective work or if your 007 dreams will have to wait a few more years. While beacons can provide some valuable insight into where a handful of your tools are located, many issues arise when you try to deploy hundreds or even thousands of beacons. The volume of small tools makes GPS™ tracking very different from GPS tracking of over the road vehicles or big yellow fleets of equipment. For starters, if the beacons were not already installed internally into the tools during the manufacturing process, someone must manually attach them to each and every tool in your inventory. Sound fun? It’s not. Especially since the beacons are generally fastened to tools with screws, adhesives or even zip ties. Beacons make sense for the large high-end vehicles or equipment fleets you deploy to jobsites, but they just don’t seem practical or feasible for every little tool that leaves the warehouse. Energy use – One last thing to consider, especially when looking a GPS solution – the energy it uses. Simply put, deploying GPS technology to an entire inventory of tools requires a whole lot of battery power. In a review that Pro Tool Reviews posted about the Milwaukee™ Tick®, the reviewer had this to say about the true efficiency of GPS. Beacon technology does have a place in your tool-tracking arsenal, but think of it more as a partner to a system that actually changes behavior and builds a more reliable and responsible field team. Rather than relying exclusively on a hardware solution to track tools, look at Apps that are rooted in the idea of building a culture of responsibility so that your folks in the field assume ownership for keeping track of the tools they borrow. By encouraging employees to be more responsible for tools, the company can reduce tool loss and wasted time without putting an expensive beacon on every piece of equipment. What you’re really accomplishing with an accountability-based system is improving an entire process. This is because Apps that track tools based on “responsibility” don’t rely on a hardware beacon, but instead rely on a person-to-person workflow. The App helps a company enforce a “transfer” and “acceptance” of responsibility between workers as tools move from person to person. This is a “worker” centric model built on changing behavior rather than a hardware centric model. ShareMyToolbox is a best-of-class solution in accountability-based tool tracking. 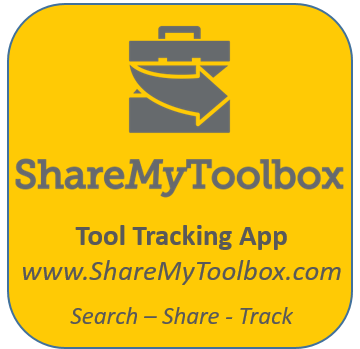 Rather than relying on hardware tracking, ShareMyToolbox creates a “catalog” of tools and assigns the tool to an employee who “accepts” it in the App. That person’s responsibility for the tool is removed once it is returned to the warehouse or transferred to another employee who accepts the responsibility. When a member of your team knows that there’s a digital record of who has a particular tool, the employee will think twice about passing it along to a friend or leaving it exposed on a jobsite overnight. They’ll be more likely to return it to the warehouse each evening. Like I mentioned earlier, beacons are great tools for adding a layer of security for tracking your larger, high dollar hardware items. But alone, they’re just not practical for most contractors’ entire tool inventory. At the base level, the smartest and most helpful tracking approach for your company has to be a system that builds responsibility through accountability. Once that’s in place, consider a beacon-based system to monitor where your vehicles or fleets of larger equipment are throughout the day. This combination will complete a powerful tool-tracking arsenal for your company. Plus, this forward-thinking strategy will help you get a little closer to international spy-status – without the exotic cars, martinis and trips around the world, of course. Learn more about modern tool tracking here. Also you can find numerous articles on tool tracking tips and contractor profiles of tool tracking success on our website www.ShareMyToolbox.com. Have you ever felt like James Bond when trying to track down tools in a construction business? Using gadgets, calling sources all to solve the mystery of where a dang tool is so you can get the job done! Well no more. There is a better, simpler way to keep track of construction tools and equipment and it doesn't require James Bond level gadgets.